15/30 Hexmag 5.56 black 15 round magazine. The Hexmag is a factory blocked mag, we di..
15/30 Hexmag 5.56 flat dark earth 15 round magazine. The Hexmag is a factory blo..
Front riveted 15/30 5.56 AR-15 Gen M2 MOE black PMAG. A 1/8" rivet has..
Front riveted 15/30 5.56 AR-15 Gen M3 black PMAG. A 1/8" rivet has been ins..
Front riveted 15/30 5.56 AR-15 Gen M3 sand PMAG. A 1/8" rivet has been inst..
Front riveted 15/40 5.56 Gen M3 P-Mag. A 1/8" rivet has been installed into the ..
Front riveted 15/30 new black Magpul 7.62x39 AK-47 PMAG. 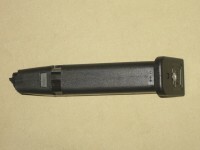 A 1/8" ri..
Front riveted 15/30 New black Tapco USA made 7.62x39 AK-47 magazine. 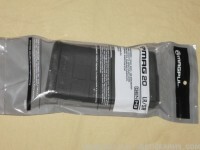 &nb..
Front riveted 15/20 Magpul 7.62x39 AK-47 black PMAG. A 1/8" rivet has ..
15/30 ASC 5.56/.223 AR-15 stainless steel factory limited magazine with black marlube finish, new. T..